If you're looking for a means through which you can have complete control over the amount of light coming into a room in your home, you need look no further than the Vision blind. What's more, it's incredibly easy to fit them on your windows! You can chose to fix Vision blinds on the ceiling or lintel (top fix), or onto the wall or window frame (face fix). Whichever fitting you decide upon, make sure you have the appropriate fittings for the surface you're looking to fix it to. We supply wood screws with your blind, but if you're fixing the brackets onto anything else such as cement, brick or plaster, you'll need to make sure you pick up the right fittings from your local DIY store. Using the pencil, mark where you're looking to fix your brackets. Remember, wherever you place them, be it top or face fitting, the outermost brackets must be 5cm away from the end of the rail. If you've been supplied with additional brackets, you can then affix these sporadically along the length of the window. When placing your brackets, be sure to account for any protruding parts like window handles or else your blind won't hang straight. 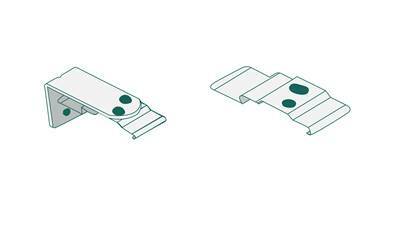 If you've opted for a top fix, the appropriate bracket can be affixed to the ceiling or underside of the recess by using the single screw hole in the centre of the bracket, with the longer end of the bracket sitting at the back, closest to the window. For a face fix, join the bracket to an 'L' shape face-fixing plate, usually supplied with your blind. Use the screw holes on the back edge of the 'L' plate to mount the bracket to the surface behind where you want the blind to sit. Simply take the headrail of your blind and put its front lip onto the brackets. Once it's aligned, push the back of the rail upwards to meet the other side of the bracket. This should engage the clip on the bracket, meaning that your blind is successfully hung! This blind comes with a child safety device - and it's important that you install this when fitting your blind. Follow the given instructions to fit the device to prevent any harm from being caused.